Young women attend event to celebrate education initiative Let Girls Learn. 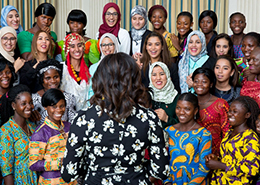 Eight young women, participants in the USAID Liberia Advancing Youth Project run by EDC, were in Washington, D.C., last week as guests of First Lady Michelle Obama. Their visit was part of Let Girls Learn, a U.S. government global education initiative. The young women first met with Obama in July when she visited the R.S. Caulfield School in Unification Town, Liberia, and led a discussion along with Liberian President Ellen Johnson Sirleaf. The visit is featured in the new CNN documentary We Will Rise, which had its world premiere on October 12. Since 2011, the USAID Liberia Advancing Youth Project has enrolled more than 22,000 learners, of which 69 percent are women. The project has also conducted training for nearly 2,000 public school teachers and administrators to enhance the delivery of basic education.